Make someone very happy this year with Fredericksburg Farm gifts from Lochte Feed! Fredericksburg Farms offers a wonderful selection of products that you will be sure to love! Come by and check out the selection of candles, soaps, lotions, bath bombs, preserves, specialty glazes, and even dip mixes all from Fredericksburg Farms! Shop local and stop by Lochte Feed and pick up your Fredericksburg Farms gifts for teacher gifts, hostess gifts, or a quick item for that company Christmas party. 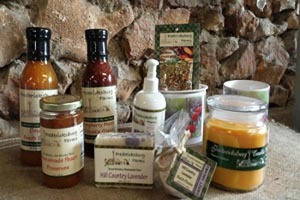 Lochte Feed carries many gift items like Fredericksburg Farm products, jewelry and much more, perfect for the holidays! This entry was posted on Friday, November 18th, 2016 at 6:02 pm	and is filed under News & Updates. You can follow any responses to this entry through the RSS 2.0 feed. Both comments and pings are currently closed.